SRM-007TA STAX DRIVER UNIT HEADPHONE AMP SRM-007TII from Japan. Brand: Stax Type Vacuum Tube Class-A DC direct Driver Unit Frequency Response DC100kHz/+0, -3dB (SR-007 1 Unit Use) Amplication 54db X 500 Inputs Impedance 50kO / XLR Balance 50kO X 2, RCA X 2, XLR X 1 (Balanced) Rated Input Level Input 200mV Output 100V Harmonic Distortion Less than 0.01% 1kHz, 100Vr. Output Maximum Output Voltage 340Vr. (1kHz) Earspeaker Output Bias Voltage DC 580V (PRO ONLY) AC Power Voltage 100V (5060Hz) Power Consumption 55W Operating Temperature Range 035C Vacuum tubes employed 6FQ7/6CG7 4 PCS Dimensions (W)195mm×(H)103mm×(D)420mm Weight 4.7kgs. Why do I recommend EMS? China, Hong Kong, Korea, Australia. 3 There is the compensation for damages system, too. If you don't receive it beyond 25 days , please contact your local post to check your parcel and tell us. What should I do if I didn't receive my item? What should I do if the item I receive is damaged or not working? Our Products are 100% Authentic. I promise to pack up the product very carefully. Although slight costs start for that purpose, I do some shopping to you in comfort, and want you to enjoy the product. If you have any question, please contact me. International Buyers - Please Note. 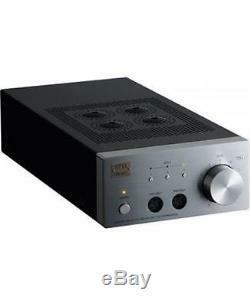 The item "SRM-007TA STAX DRIVER UNIT HEADPHONE AMP SRM-007TII from Japan" is in sale since Thursday, November 29, 2018. This item is in the category "Consumer Electronics\Portable Audio & Headphones\Headphones". The seller is "airbag777" and is located in Japan. This item can be shipped to North, South, or Latin America, all countries in Europe, all countries in continental Asia, Australia.